Last week, I said I was organising three live events over the next month and that there would be more about those in this entry. On reflection, I think this is better done as a reactive post, as I can then talk about two of the final performances. So that will definitely appear next week. A couple of weeks ago, I was in a pub in Stockton-on-Tees called the Thomas Sheraton. Behind the bar was a coffee machine with the label ‘Biscuits don’t live here’. For some reason, I found this particularly amusing. By the time my meal was served, I’d written a good chunk of a piece that’s now sitting at around 350 words. It’s a surreal narrative about anthropomorphised biscuits are who are fed up with people and are leaving town. Normally when I look back on work, I’m inclined to remove words from it. In this case, however, I’ve added words almost every time. But where is the line between a nonsense piece and one that’s simply rubbish? Here’s my view on the matter. The Bob Dylan track Subterranean Homesick Blues is a disjointed sequence of phrases and imagery. It’s lauded as summing up the counterculture movement of the day. However, even taking into account that many of the references are now outdated, I simply don’t find the lyrics cohesive enough to enjoy them. By contrast, I thoroughly enjoy the Simon Armitage poem Thank You for Waiting, which is structured as an airport boarding announcement, but the categories of passengers he describes become increasingly more bizarre. Taken together, all the lines poke fun at the class system. So for me, even a loose cohesiveness or some form of internal logic makes all the difference between the nonsense I enjoy and the nonsense I don’t. Remember this is only my definition, and it’s not wrong to like what everyone else hates, or vice versa. Helping @SuitedSorted Improve His Blog, and Hints for Everyone Else. I hadn’t written a response blog for years, and now this is my second in a fortnight. But this time, it was requested. Scott Graham runs Suited Sorted on Blogspot, where he has recently re-focused on Android technology, although he has back entries discussing music, television, holidays, and weight loss. He has asked for some constructive criticism about the page, and with ten years’ blogging experience, I reckon I’m qualified to pass on some tips. Scott wonders if he’s a little too conversational. There’s a certain style that many bloggers go for, whether they mean to or not. The closest off-line equivalent is an opinion column in a newspaper. You’re telling the reader your view on a particular matter, but using everyday spoken words. For instance, you’ll say asked for rather than requested, or use contractions like can’t instead of cannot. But this isn’t a licence to spell words any old way, or leave out punctuation where it’s needed. 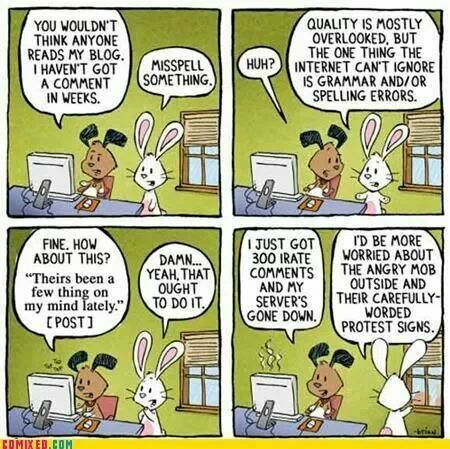 Almost every piece of blogging software has a spellchecker. Spelling extensions are available for Firefox and Chrome, most mobile phones have the facility built-in, and the latest edition of Microsoft Word even lets you post to WordPress directly. If the reader doesn’t have to decode what you’re trying to tell them, your message will come across much stronger. Scott, you’re doing fine on that front. Newspapers and magazines learnt early on that long articles do not translate well to the Web. When you’re reading a three-page printed interview, your neck automatically moves downwards as your eyes follow the text, where scrolling down with your hands requires more conscious effort. A normal screen – not an e-ink display – is also brighter than a page, so it’s harder to read from. That’s why I restrict my paragraphs to about three to six lines, and leave a clear line between each one. A lot of people will give up reading a wall of text, if they attempt it at all. Your paragraphs can be quite long, Scott, but certainly not the dreaded wall. Using the site analytics tools on WordPress, I’ve found that my posts attract more attention and reaction if I post them between around 6pm and 10pm Monday to Friday. Entries made at any time on Saturday or Sunday simply don’t seem to be noticed. Certain tags also seem to generate interest, while others have no effect. For years, I posted with LiveJournal and tagged my entries. I very much accepted that hardly anyone except my friends read the page, as they were the only ones to comment. But when I moved to WordPress, I realised I’d been missing out on this vital piece of analysis. Everyone will be different, and some will find that daytime or weekend posts work for them. So keep tagging your entries, Scott, and have a look at Blogspot’s analysis tools to find out exactly when people are reading you. I hope you’ve found this critique helpful. To everyone else, I’ll be pleased if any of my suggestions help you with your own blogging.